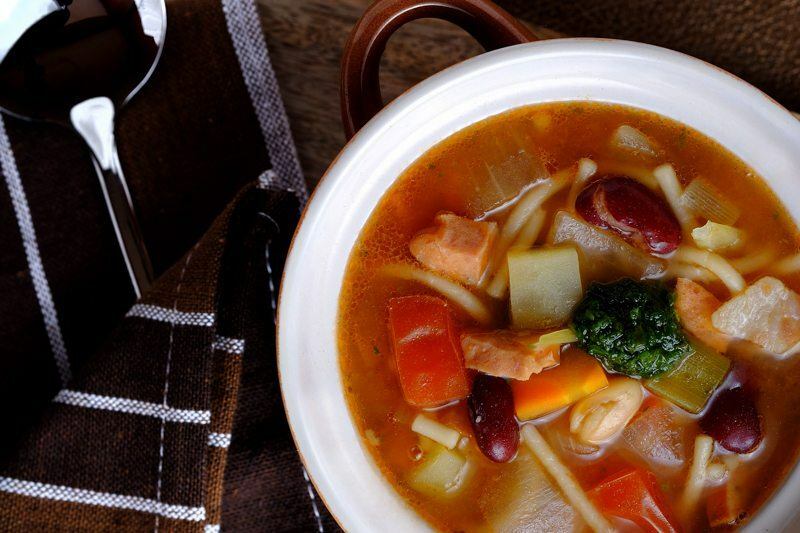 Traditionally based on a bean broth, Borlotti beans to be specific, Minestrone more commonly features vegetables that are seasonally available. This is the perfect recipe that you can pull off from rummaging into your pantry. 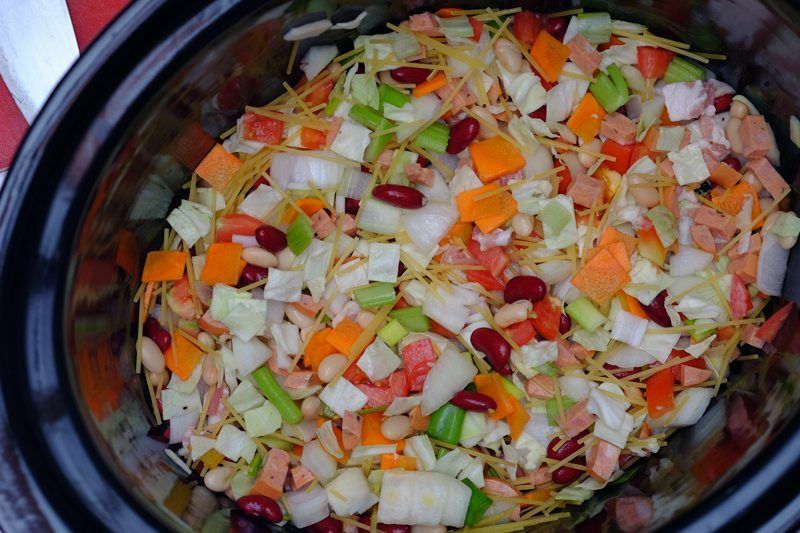 Take some lentils, some pasta or rice, a meat component, a few vegetables, tip 'em into a crockpot with some stock and you're all set. Here I used red kidney beans and white navy beans for my base. Don't stress out looking for these exact varieties though, go get what's available, use as much types you like. No restrictive ratios either. For the vegetables, I used carrots, celery stalks, cabbage, potatoes, tomatoes, and leeks. I also added onions to give the broth a sweeter after-taste. For some body and color, I added a bit of tomato puree. For the meat component I added cuts of bacon, and Bratwurst sausages. Again, feel free to use what you fancy – ham, ground meat, chunks of chicken. To complete the dish, I added in spaghetti which I broke up into tiny sticks so they'd end up cooking into pieces that would easily fit into a spoon together with the rest of the other ingredients. My current favorite slow cooker is this shiny beauty you see above. It's the Crock-Pot programmable touchscreen SCVT650-PS. 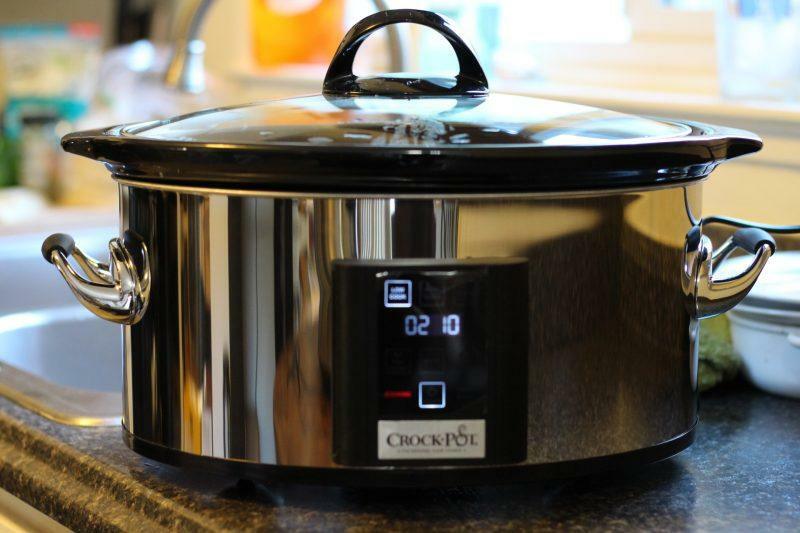 I also really like the Crock-Pot (yeah, I like the brand), Cook and Carry Programmable 6 quart model. It's a more traditional look, with a digital programmer so you can set the time to cook. I prefer the programmable version even though they cost a bit more because it means I can leave the house for a few hours and not worry about my food overcooking! 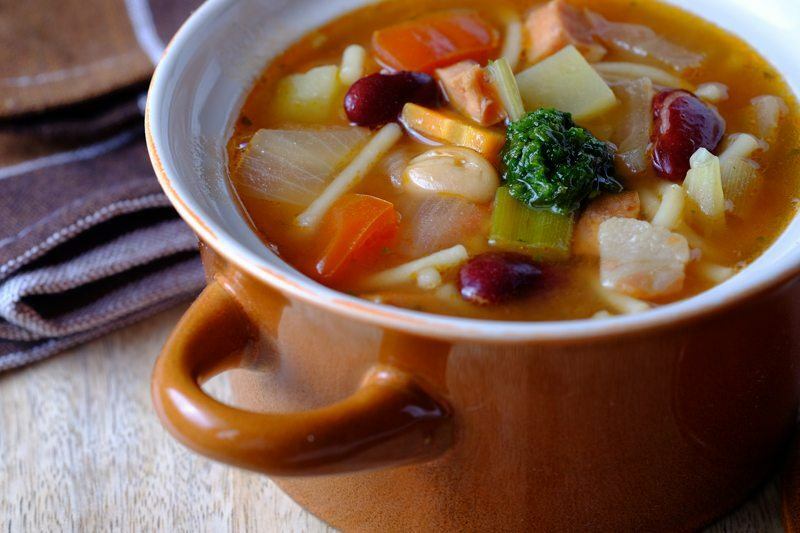 Finish off with some stock – vegetable, chicken, beef work equally well. A tip for you : a standard soup cup holds 200-250 ml of liquid. So cooking for 10 servings would mean you'll have to use 2.5 liters of stock. 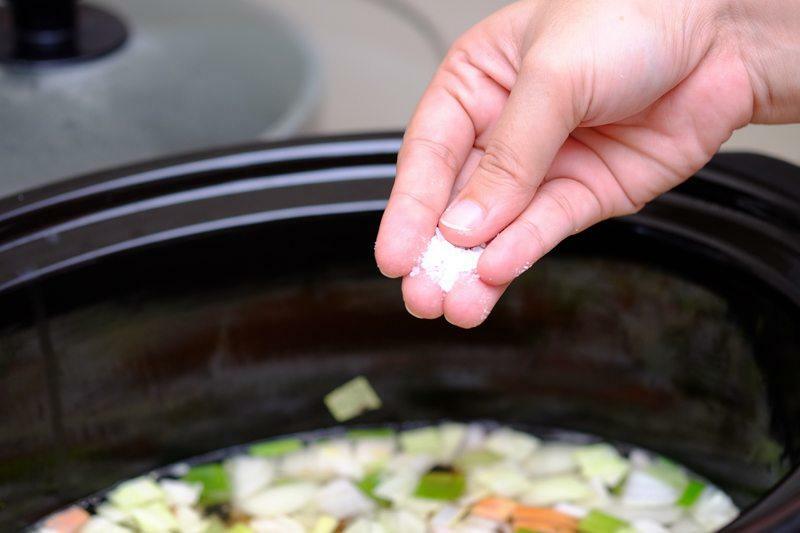 Before ladling into serving bowls, take a quick taste and adjust with a bit of salt and pepper. 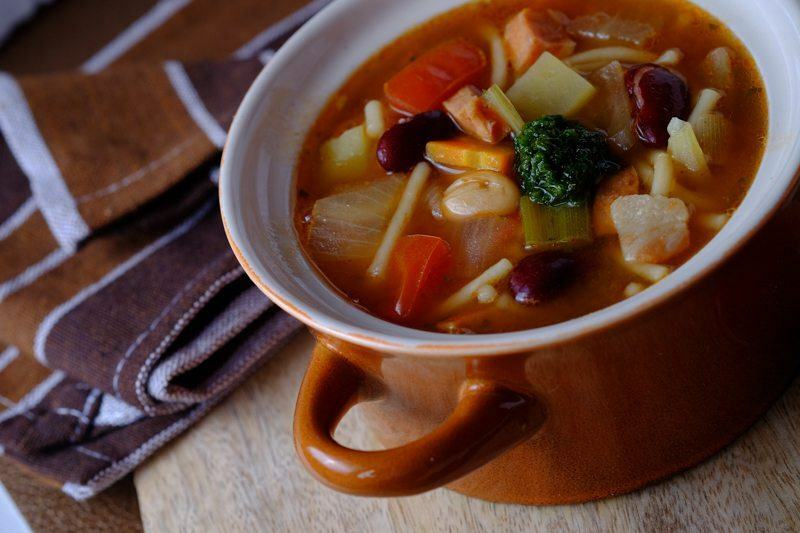 Bear in mind though that you'll be topping off the soup with parmesan cheese which would further add some saltiness. 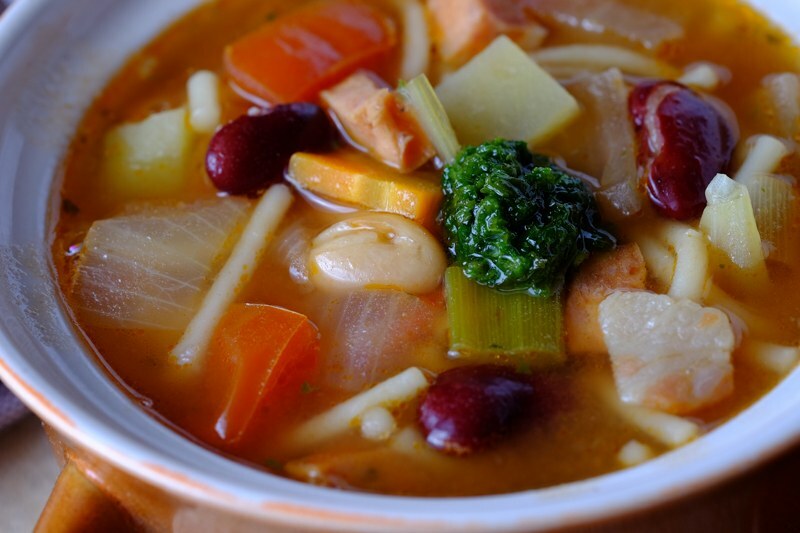 Minestrone Genovese, a later variant of the soup, is served with herbs or an herb paste. I like mine with freshly made pesto. No rules with pesto either. 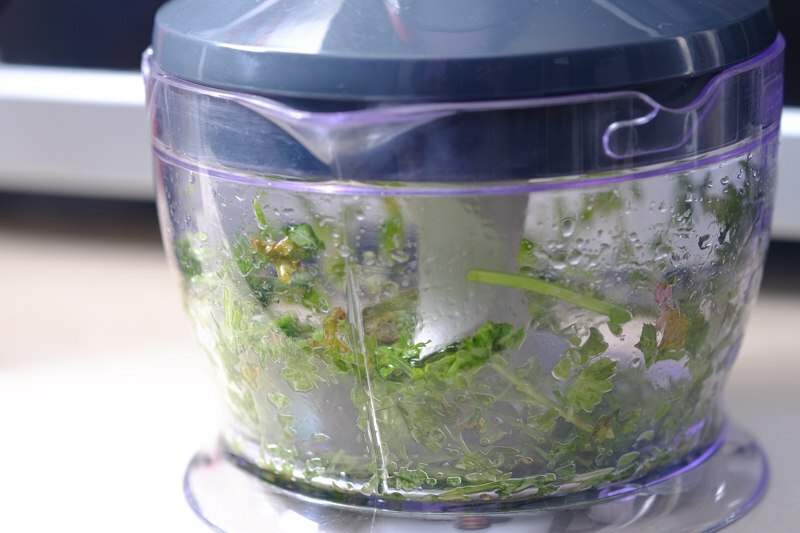 Go take an herb or a mixture of herbs you like, grind them to a paste, and that's it! Here's what's in mine : parsley, basil, garlic, toasted pine nuts, parmesan cheese, olive oil, salt, and pepper. I don't measure, and just go by feel. I like to go lighter on the parsley though because it can easily overpower the basil and like to add a lot of pine nuts for their very distinct earthy flavor. 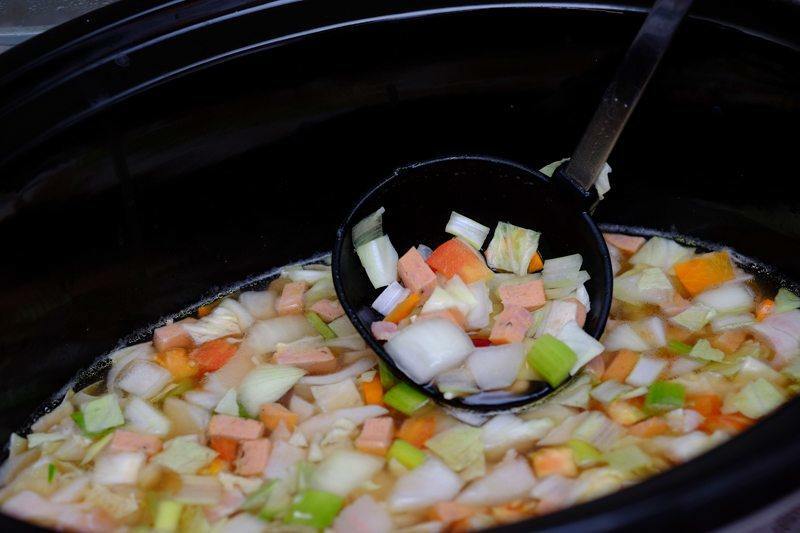 Here's a suggested trick : ladle some soup out, solids and broth, puree in a blender until smooth, and add it back into the crockpot. This will slightly thicken the soup giving it a fuller texture. 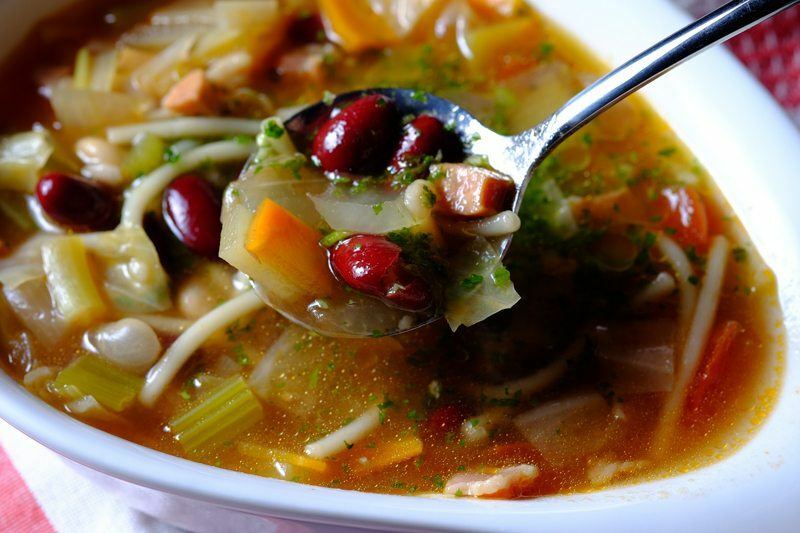 This is a very good go-to recipe for those cold winter nights. Can be done with basic pantry ingredients and with very little preparation. 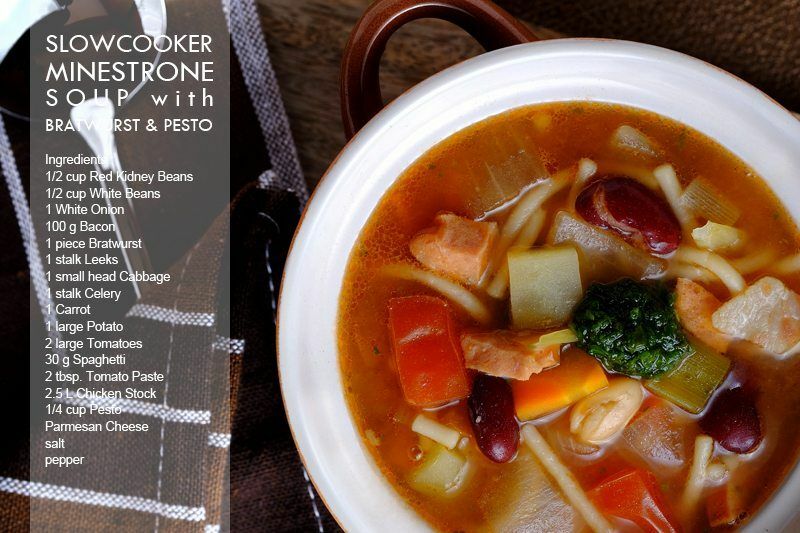 Combine all ingredients except for the pesto and cheese in the slow cooker. Serve topped with pesto and shaved parmesan.